Further on in the post she mentions making a shakshuka recipe from Smitten Kitchen, and it reminded me that I have been collecting different shakshuka recipes from around the web and some cookbooks and I had been wanting to make it for a while now. One thing that usually stopped me is that all of the recipes call for at least six eggs and make enough to feed an army. It does seem like the perfect group/brunch type meal and Eve did not even particularly care for that recipe, but it was Saturday morning and I was hungry and I had just bought the cutest little 13-ounce packages of crushed tomatoes my neighborhood grocery store started carrying and has been selling on special for .99 cents a box and I started thinking that was the perfect amount of tomato for a two-serving dish. 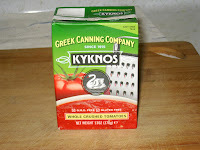 I love these cute little packages, and 13 ounces is the perfect amount for many of the dishes that I cook so I don't have all of these little jars of leftover tomato for which I have to find a use before they go bad or I forget that they are there. They have been on special since they first appeared at the store a few months ago and I have been stocking up on them. I now have a pantry shelf pretty much fully devoted to them. I decided there was no reason I could not scale the recipe down for two eggs. I have a skillet that is just the right size, so I decided to give it a try. I was quite pleased with the results. Eve wanted more spice with hers, but I enjoyed the subtlety of just the cumin and paprika. The harissa probably helped, as well. This was so good I made it the next weekend, and now I make it every few weeks. It is the perfect weekend breakfast/brunch. The beauty of it is that you can adjust the amounts for as many or as few eggs as you want to use. Heat oil in small skillet over medium heat. Add onion and garlic and cook until softened, about 5 minutes. Add the zucchini and cook another 2 to 3 minutes. Add the tomatoes. Season to taste with the salt and pepper and add the cumin and paprika. Cook the mixture at a simmer until it has thickened considerably. Make two wells in the mixture and crack the eggs into the holes. Reduce heat to low, cover, and cook until the eggs are set to the desired consistency. 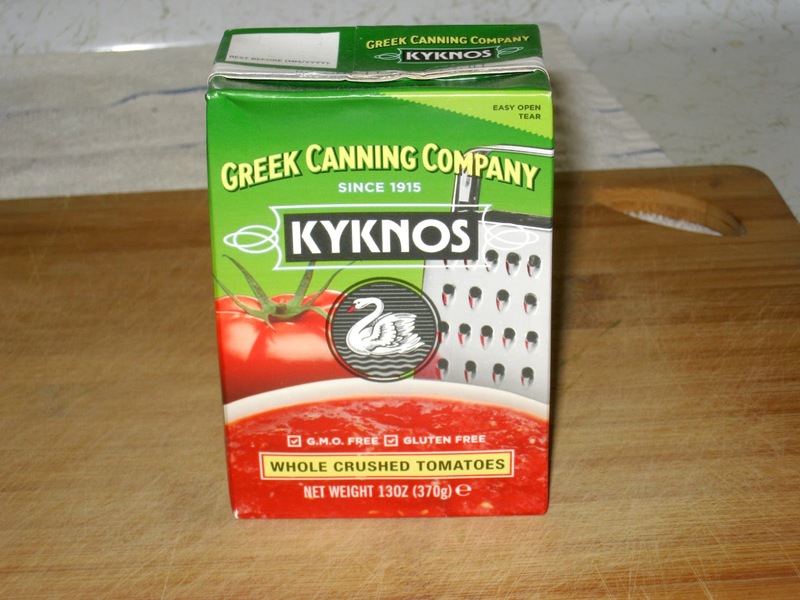 Top with harissa and serve with lightly toasted bread, if desired. 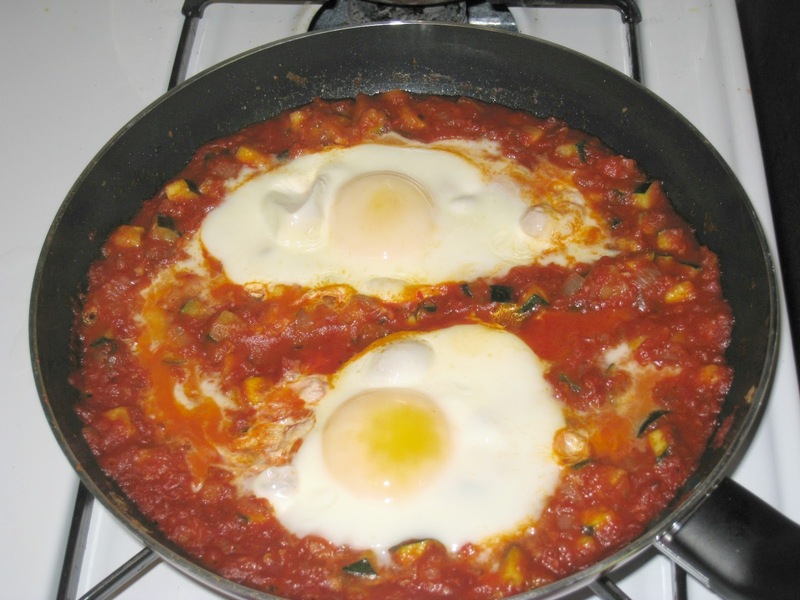 I bet your homemade harissa really does make the difference in the shakshuka. Oh my, that does look good. I will definitely be giving it a try. But in the meantime, I am really loving the shakshuka with the harissa.